Adventures in Wonderland is an exciting 5-reel video slot with 20 pay lines developed by Ash Gaming. This fun slot game is based on the novel by Lewis Caroll called Alice’s Adventures in Wonderland written in 1865. The video slot stays true to the original cult classic and the movies that proceed it. The bonus features presented in this game include Pocket Watch bonus round, Mad Hatter’s Tea Party and a progressive jackpot with a top paying jackpot bonus worth 10,000 coins in the base game. Adventures in Wonderland is based on the classical fairy tale that features a young girl called Alice, who dreams of a land with outlandish cartoon characters that are quite peculiar. The background takes place in Wonderland with wild mushrooms, berries, flowers and tree vines surrounding the reels to add to the ambiance. The video slot features symbols that are taken from the original story including the Caterpillar smoking a hookah, the Cheshire Cat, Tweedle Dum and Tweedle Dee, the Mad Hatter, the White Rabbit, Alice herself and the lower valued symbols consisting of playing cards ranging from 10 to Ace. Adventures in Wonderland has a great selection of betting options with coin denominations ranging from £0.01 and going as high as £0.25. You will be able to adjust the pay lines from 1 to 25 with the minimum bet of £0.01 on a single bet and the maximum of £200.00 on a single bet when all pay lines are activated. There is a list of special symbols presented in the game and includes the Mad Hatter scatter symbol that activates the Tea Party bonus, Rabbit Hole scatter symbol that activates the Rabbit Hole bonus, White Rabbit symbol that activates the Pocket Watch bonus and Alice who represents the wild symbol in the game. Displaying three or more Mad Hatter scatter symbols will activate the Tea Party bonus feature. You simply need to pick from the selection of guest and serve them tea. The more tea they drink, the more you will win. The progressive jackpot can also be claimed during this bonus game, and it’s randomly awarded. Should the spoon in the sugar bowl serve sugar one of the guests, you will claim the progressive jackpot. The Rabbit Hole symbol will only make an appearance on reel three, and once it does, you will follow Alice down the Rabbit Hole while collecting several cash prizes on her way down. The game ends once she reaches the bottom. Displaying three or more White Rabbit scatter symbols will trigger the free spin feature. You will first need to spin the hand on the pocket watch to reveal the number of free spins awarded. The White Rabbit will then jump over the reels, leaving 3 to 5 sticky wilds where he lands. The sticky wild symbols will remain in place until the free spin feature is over. 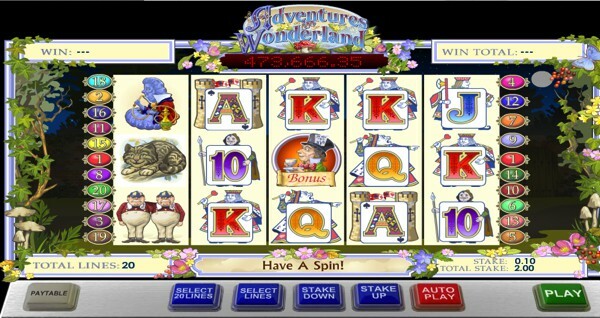 Adventures in Wonderland is a well-designed video slot featuring a range of different bonus features to keep you occupied. The slot volatility is of medium to low variety, making it a well-balanced game with regular wins while providing some decent pay outs. Adventures in Wonderland is a game from Ash Gaming and can be found at BGO Casino.